Green Tea Extract – A Caffeine Substitute? Late one night, I had been too tired to go to sleep watching cable television. My remote had stopped on a Dr. Oz segment focusing on products to reduce aging. One product had quite of bit of marketing hype on the internet, Green Tea Extract. Whether in pill or tea form, Green Tea Extract had been positioned as powerful antioxidant with a host of applications. What had gotten my attention, Green Tea Extract’s thermogenic effects on the body. The mild burst of energy from oral consumption had been an intriguing property. For my application, I had been looking to supplement caffeine in the morning or before a workout. Caffeinated gum, sodas, and assorted energy drinks, had been too much to stomach with their over the top percentage of caffeine and/or sugar. Green Tea Extract, while providing 2% to 4% caffeine by volume, had offered a slow and short rise in energy. This supplement had provided no ill effects like jitters or uneven temperament. Any claims of weight loss or hungry suppression by using Green Tea Extract, I had not been able to verify. Whether at work or home, I had never felt unable to focus, sleep or eat as with other products like 5-Hour Energy, Stacker or RockStar. For reference, my consumption had been limited to one pill (400 – 600 mg), accompanying a protein shake during my mornings. I had tried a formulation from the Vitamin Shoppe and the Spring Valley brand above. There had been no big difference in the brands, less pill count, concentration and price. The manufacturers’ maximum recommended dosage, had been two pills with meals three times a day; However, the daily recommended dosage had seemed more like a marketing ploy to sell product (i.e. lather, rinse, and repeat). If you workout or want to replace coffee, I had suggested a review of Green Tea Extract. Dr. Oz’s Green Tea Project on weight loss. 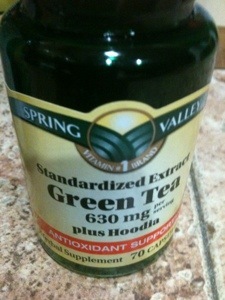 This entry was posted in Health and tagged Green Tea Extract A Caffeine Substitute?, health, Weight Loss, Working out. Bookmark the permalink.